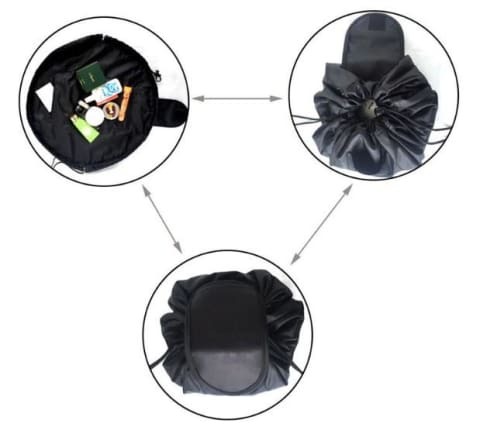 Carry all your make up around easily with our Drawstring Cosmetics Bag! Conveniently Organized - Say goodbye to digging and dumping in a traditional (black hole) bag! 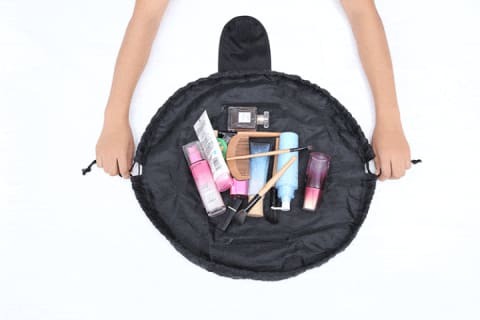 This amazing drawstring makeup pouch enables you to unpack and pack your cosmetics in just a matter of seconds! No more delays for that last minute retouch! Stylish and Wide Compartment Coverage - Not only does this compartment excel in functionality, but it also comes with a wide range of design options that will definitely suit your taste! It also features a wide compartment that measures approximately 20"Diameter (48cm Diameter)! Sturdy and Secured - This amazing cosmetic companion features a raised lip that keeps your makeup, brushes, and other cosmetics from rolling off the counter! Simply open it flat for full access, cinch the drawstring closure to seal and convert it into a clutch! Easy to Wash - This cosmetic pouch is 100% Machine Washable! This translates that it is safe to just simply toss it to the washer and expect it to be clean along with your laundry! See All Your Cosmetics at Once. Clean Up in Seconds!